Sales leaders drive their sales process & teams using leading sales indicators. They take this approach because it’s proven to “maximise middle performers”. In other words, they manage this way in order to get more from their existing sales resources. They also use this data to determine if there are any friction points across their sales process that require attention. What do we mean by ‘leading indicators’? Essentially, these are the high-value steps that move us along the journey towards a closed/won deal. The traditional sales target however would be considered as a lagging indicator. Lagging Sales Indicators track what has happened. Think of them as backward-facing metrics. For example, “Close £100K per quarter” would be a lagging metric. And because they are rear-facing, lagging KPIs are very hard to influence. By the time you have measured the outcome it’s too late to do anything about it! Which is why sales leaders have started to focus heavily on leading indicators. Leading Sales Indicators are the steps needed to reach our lagging metric. Think of these metrics as forward facing. For example, we know that if we make enough ‘meaningful’ calls every day we are more likely to close more revenue. So, a good leading KPI would be ‘30 meaningful calls per day’. You will notice that in both cases these example metrics have a quantity and are time bound. Clearly, this is not the case for every leading sales indicator. Combining quantity and time together like this form a critical factor in making sure we achieve the right level of sales cadence needed to hit the overall sales objective. In other words, to ensure we are running fast enough to reach our sales target. This brings us nicely onto the second sales capability. Before you read on, why not download our Ultimate KPI Checklist to learn the 70 leading KPIs you should be tracking? Sales folks love winning. Give them a target and they will relentlessly strive towards it. So why is it that we only give our reps one target measured across an impossibly long period of time? Achieving the annual revenue target is of course vital. But it’s the approach to getting there that this new breed of sales leaders has overhauled. Imagine having the ability to dial-up the pace of achievement of these leading sales indicators. You know they form up the path to success. So, it stands to reason that performing more of them should lead to an increase in successful sales outcomes. These are just a small sample of the ‘leading’ sales metrics that take care of the ‘lagging’ sales revenue metric. 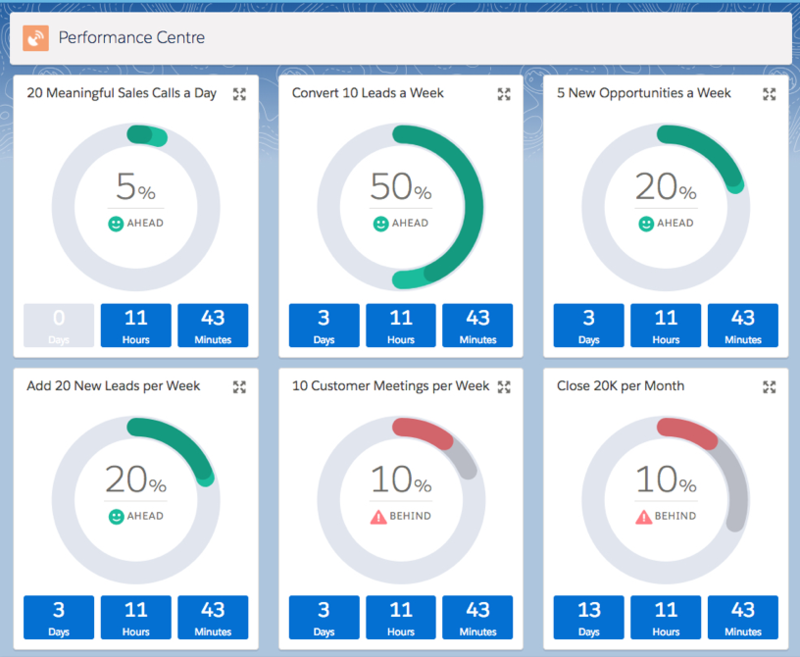 Imagine if you could combine achievement of these leading sales metrics into a regular cadence of daily, weekly, monthly or even quarterly targets. This would allow you to drive the sales behaviours right across the sales process that delivers sustained success. Traditionally, sales managers have only coached around deals. Reps trot along to a weekly deal review to have deals that are slated to close this quarter analysed for health and cross-examined for appropriate next steps. This old-school style of deal coaching is a little like the lagging indicators we described above. Why? Because oftentimes it’s only the late stage deals that are analysed. They are typically explored using gut-feel and intuition. They have to be because the picture of the deal presented by the CRM system is riddled with holes, or worse still was updated by the rep last night. And by this time, it’s often too late to determine the real health of the deal and return it to a winning path. Much like lagging indicators, by the time you realise what the outcome will be, it’s too late to do anything about it. This is why sales leaders are using guided selling to coach adherence to the sales process. The difference with the new breed of sales managers is that they do not treat it as a passive, tick-box version of guided selling. They have realised that by identifying and driving the leading indicators during each stage of the sales process they can ensure deals remain on the path to glory. The beauty of this approach is the total removal of gut-feel and intuition. 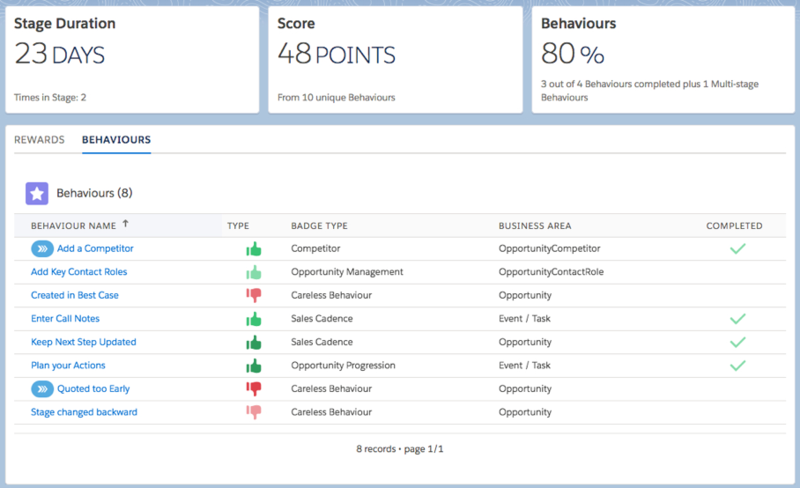 Using SuMo to automatically track and record achievement of high-value sales behaviours (or leading sales indicators) presents the sales manager with a data-driven, factual view of the health of a deal. Imagine your sales leaders viewing headline information for the particular stage a deal is in. Data that includes the stage duration and how many of the required sales behaviours have been completed. From the checklist underneath, it is simple for the manager to see what has been completed and what has been missed. SuMo even tracks positive as well as careless sales behaviours to give a true picture of health. This approach makes it incredibly simple for the sales leaders to see if the team have left any gaping holes during the sales engagement. Gaps that might make the deal unravel at a later stage. So, it’s easy to see how leading indicators can help us with deal coaching. But what about rep coaching? We all have reps that love the thrill of the close but get easily bored with prospecting. We probably have also all managed reps that enjoy the early flirting with prospects and the thrill of closing a new meeting. Only to get bored and lose interest along the sales journey. By analysing the achievement of high-value sales behaviours by individual sales rep, it quickly exposes their strengths and weaknesses. This level of insight presents sales managers with a data-driven picture showing the precise areas where reps need a little extra coaching. SuMo will help you to first uncover and then drive the behaviours that lead to more booked deals. How about downloading our latest white paper 4 steps to a clean & healthy pipeline.